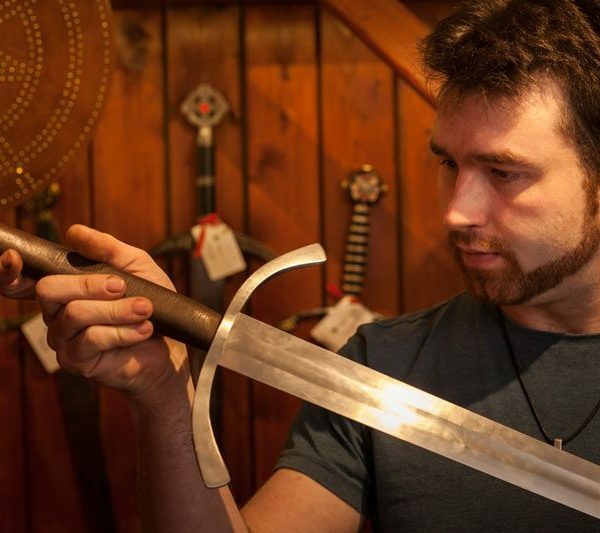 As Scotland’s only bespoke sword-making retailer, here at The Knight’s Vault you can now design your own traditional, historical sword which is made-to-order. Our highly skilled team will work with you to design every element of the sword, from the blade to the hilt and the guard to the pommel, before hand-crafting the sword to your exact specifications. From our workshop to your door in four to five weeks, our talented blade smiths will produce your bespoke hand-made sword using only the finest materials and the utmost attention to detail. We ship to all international locations from just £30. Your fully customisable sword can be further personalised with engravings, logos or a coat of arms so whether it’s a gift for a loved one, or a special something for your own collection, your sword will be one of a kind. Contact us now at shop@theknightsvault.co.uk or on +44 (0) 131 281 4147 or +44 (0) 800 093 7005 to discuss your bespoke requirements.